The Home Mini is also a direct response to Amazon’s wildly popular Echo Dot, which sells for around $50 and provides many of the same smart speaker capabilities. 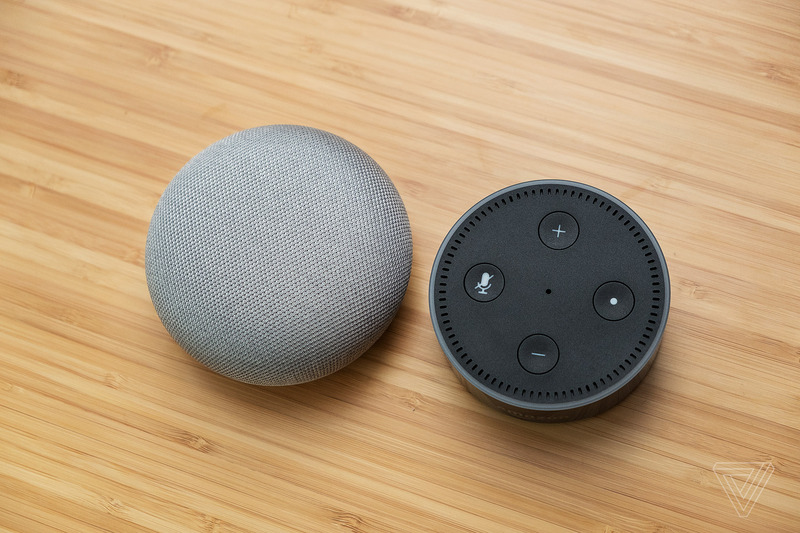 Like the Echo Dot, the Home Mini is small enough and cheap enough to put in any room of your house, blanketing your home with an always-listening voice-controlled computer. Those are the broad strokes of the Home Mini, and there really isn’t too much to add there. If you’ve been eyeing a Google Home because you use a lot of Google services, but its price and / or size have kept you away, the Home Mini is probably exactly what you’ve been waiting for. Or if you already have a Google Home and want to extend its capabilities to other rooms in your home, the Home Mini will fill that need, as well. But as with anything, the devil is in the details, so let’s dive into those. 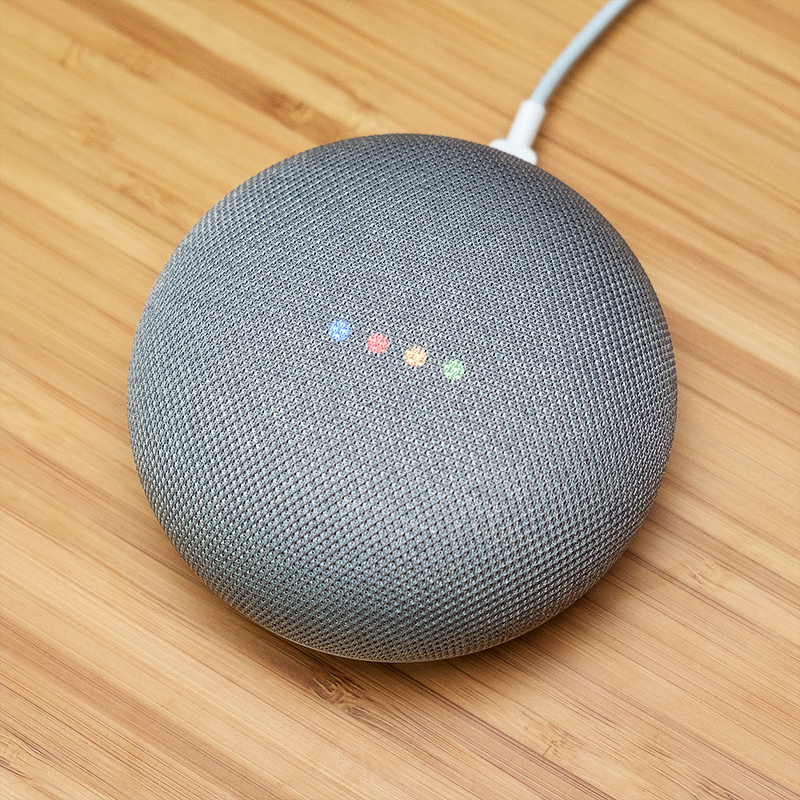 Google likes to say that the Home Mini is about the size of a “donut,” in a pretty naked attempt at making you associate it with a comforting thing that you like. As a description of size, though, it’s apt: the Home Mini is much shorter and flatter than the air freshener-inspired Home, with a roughly 4-inch diameter and curved sides. It’s a little larger than the Echo Dot, but its sloping sides and softer shape are much less ominous looking than Amazon’s product. The Home Mini comes in three colors — light gray, dark gray, and coral red — all entirely inoffensive and designed to blend discreetly into a modern, HGTV-slash-Apple-Store home décor. The top of the Mini is covered in a textured fabric, which looks great when it’s brand-new, but I worry that it will become a dust collector in short time. Having to vacuum the top of my smart speaker instead of just wiping it off with a rag is something I never thought I’d have to consider, yet here we are. Cat owners may also have to contend with their pets viewing the Mini as a toy or scratching pad. That fabric-covered top is also the main physical interface for the Mini, when you don’t want to use your voice to control it. Tapping the left or right side of the disc will lower or raise the volume, while tapping the middle will pause music, stop an alarm, or cancel a command. The touch controls are very sensitive, and a slight brush against it will change the volume or pause music. It makes it difficult to pick up the Home Mini without adjusting something. The Echo Dot’s push button volume up and down controls are easier to use and less likely to be accidentally triggered, for what it’s worth. 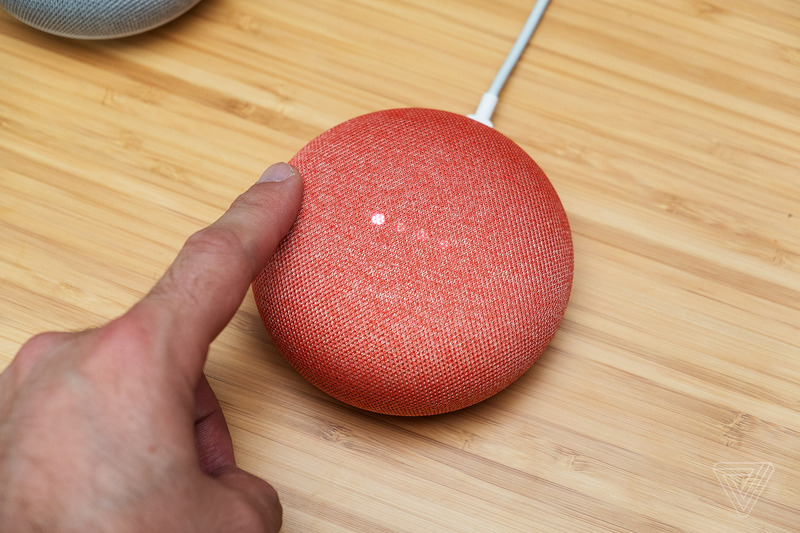 At the Home Mini’s announcement, Google said that you could tap and hold on the top of the speaker to activate the listening feature, in lieu of using the “OK Google” or “Hey Google” wake words. 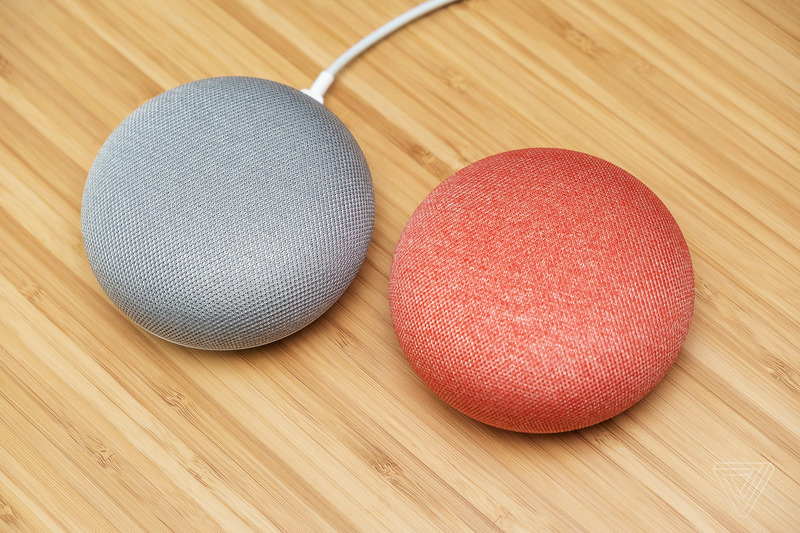 Due to a bug that caused some Home Mini units to wake up frequently and record snippets of sound when they weren’t supposed to, Google disabled this feature until further notice with a software update. Both Home Mini units I tested immediately installed what I assume is this software update upon setup, so I was never able to use the tap-and-hold feature. The activity logs in my Google Home app did not show any suspicious or inadvertent recordings, either, so it appears that I did not encounter this bug. Given the issues with touch sensitivity and the potential for reliability problems down the line, I’m of the position that the fabric cover on the Home Mini is one toke over the line of form versus fashion. It does look very cool and presents nicely, but that clearly comes at a cost to the product’s usability and longevity. Embedded in the fabric are four multi-colored LED lights that let you know when the Home Mini is listening, processing, or muted. They are not nearly as bright or easy to see from across the room as the Echo Dot’s spinning ring of lights. The only other item of interest on the Home Mini’s hardware is the physical mute switch on the back of it. Slide the switch and the Home Mini will turn off its always-listening microphones; slide it back and it will return to its normal, surveillance state. You can also mute the Mini by voice, which then presents confusion when it is muted, but the switch is in the listening position. Flipping the switch to mute and then back is necessary to activate the microphones again, which is a clumsy process that wouldn’t be needed if the mute switch was a button, as it is on the larger Home. While the larger Home has three speakers to drive an impressively full sound, the Home Mini makes do with one, top-firing speaker. As a result, it does not sound nearly as good as the larger Home, and does not work well to fill medium to large rooms with music. That said, the voice responses from the Home Mini sound great — much better than the can of bees you get from Amazon’s Echo Dot — and it does get loud enough to hear from across my living room. The two, always-listening microphones are also able to hear me from across the room, even while other music is playing, which makes the Home Mini ideal for hiding in a corner and just barking commands at all day. But despite the good-sounding speaker and far-reaching microphones, the calling feature, which lets you ask the Home or Home Mini to place a call, does not work very well at all. Calls sounded choppy and distant on the Home Mini, while callers on the other side complained of similar issues. My soundbar happens to be Cast enabled, so I set the Home Mini to default music playback to the soundbar whenever I requested it. This largely worked well, with a little bit of a lag to wake the soundbar up and connect it to the stream. Standard voice commands and replies still came out of the Mini’s speaker instead of punting to the soundbar every time. But unless you have a Cast speaker system already in place, this feature won’t be of any use to you. 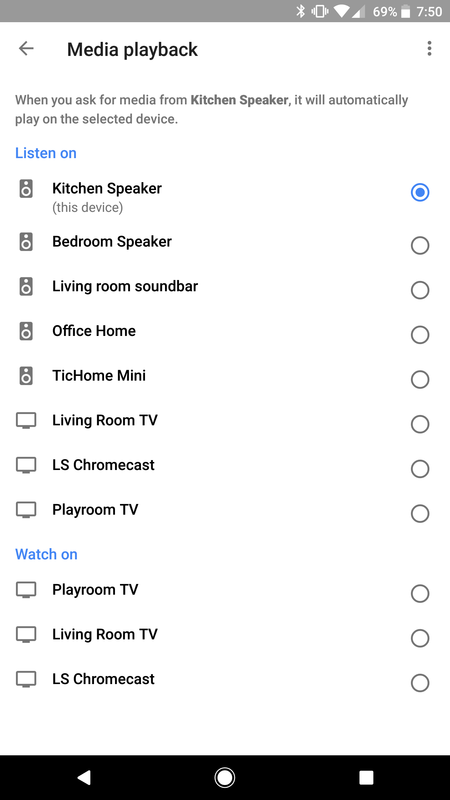 As with the audio linking, you can also set a default Chromecast to show videos that you ask Home Mini to play, so you don’t have to say the name of the specific Chromecast you want to use each time. Here’s something I hope Google considers for the next iteration of the Home Mini: an integrated battery so I can move it around my house with ease. If the Home Mini had a battery, I could use it on my nightstand for an alarm, and then unplug it and bring it in the bathroom to listen to music while I take a shower and get ready for the day. Or I could take it out to my patio and have voice-controlled tunes while relaxing or grilling outside. It wouldn’t need to be a long-lasting battery — four hours of play time would do — but it would make the Home Mini much more flexible as a small home speaker than it currently is. Back in April, Google turned on a feature that allows Home devices to recognize your voice and customize answers to you. Now called “Voice Match,” it works on the Home Mini, too. Once Voice Match is set up, the Home can determine your specific voice and act accordingly; the company likes to use the example of asking the Home to “call mom,” which will use Voice Match to figure out that you want to call your mom and not your spouse’s or roommate’s mom. It can also present personalized calendar information based on who’s making the request. But Google Home still doesn’t support any work accounts, which is where the majority of my calendar appointments and tasks are found. It doesn’t even support Google’s own G Suite accounts, which is all but inexcusable at this point. I’ve been using Amazon’s Alexa and Echo products to control the smart home gadgets in my house for years, and the Home and Home Mini have similar capabilities. But Google’s integration with smart home products is not as broad as Amazon’s yet, and it can’t control as many products. You can ask it to adjust the temperature on a Nest thermostat, but it can’t control an Ecobee. It can integrate with SmartThings, like Alexa can, but its implementation is not as good or reliable as Amazon’s. The Home Mini is best suited for those that live deep in Google’s ecosystem (and don’t have their work accounts tied to G Suite). It’s the best way to voice control Google Play Music, and Google’s wealth of internet knowledge provides more answers to queries than any other voice assistant. But if you aren’t committed to Google’s ecosystem, the Amazon Echo Dot remains the better option, even if its voice doesn’t sound as good as the Mini’s. The Echo Dot is more compatible with more services and products than Google’s, which makes it a better in-home, voice-controlled computer than the Home Mini is — at least at this point in time. The Dot also has a standard 3.5mm aux jack, and whether you think that sort of thing is necessary on a phone or not, it’s undeniably useful on a little smart speaker. Google Cast speakers are still few and far between, limiting the Google Home Mini’s usefulness to people who aren’t totally committed to Google’s ecosystem. Google’s not done with its Home ecosystem, however, and it’s been adding features and plugging gaps quickly in the year since the first Home debuted. Its next trick is more hardware in the form of the Google Home Max, so stay tuned for that.